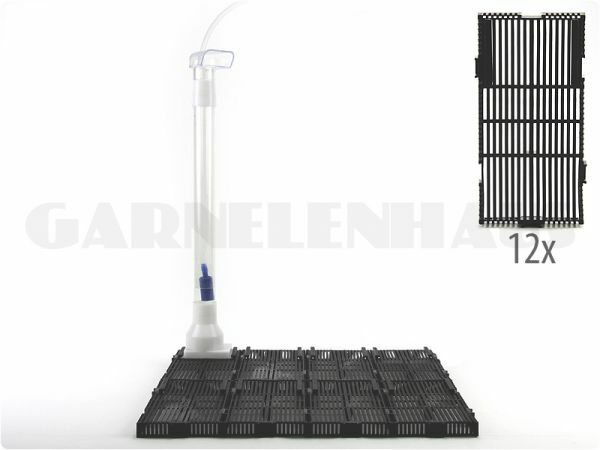 Air-driven undergravel filter with 2 extendable riser tubes, continuously adjustable from 34 to 52 cm (can be shortened further- simply saw off the tubes). Each tube holds an integrated air stone. The 12 filter plates can be put together variably. Each measures 14 x 7 cm. The filter slots are 2 mm wide. The entire substrate turns into a biological filter. Undergravel filters are a great choice for shrimp keeping and breeding. Potentially harmful substances that are created when the droppings of the shrimp and leftover food break down are sucked down into the substrate. This air-driven filter guarantees high oxygen levels in the water. Especially recommendable for breeding and keeping Bee Shrimp, and in combination with Shirakura Red Bee Sand. In addition to its other advantages, its highly porous structure is an ideal filter medium and promotes the development of beneficial bacteria. When used with an undergravel filter, this active soil is most efficient. For installing this filter you will need a T junction or regulating valve for the air hose if you plan to use one air pump to drive this filter (or a second pump), and maybe some more air hose. Please order separately.